KML’s license holding includes a significant land package in the Kalahari Copper Belt alongside major peers. 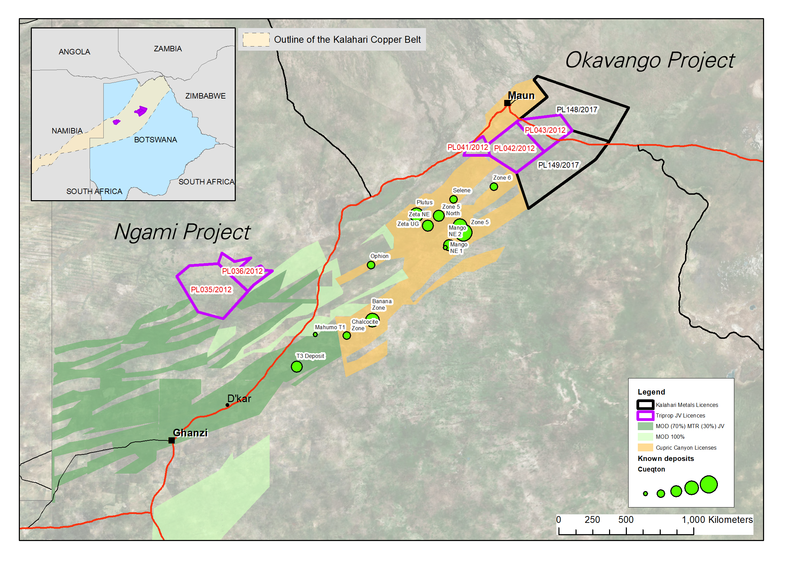 License holding has been divided into four large projects, namely: Okavango Copper Project (OCP); Ngami Copper Project (NCP); Kitlanya West (KIT-W); and Kitlanya East (KIT-E). Several priority targets where Cu-Ag mineralisation may be upgraded in anticlinal hinge zones identified in AEM data which successfully maps the geometry of less resistive marker units in the lower D’Kar Formation above the prospective mineralised contact. 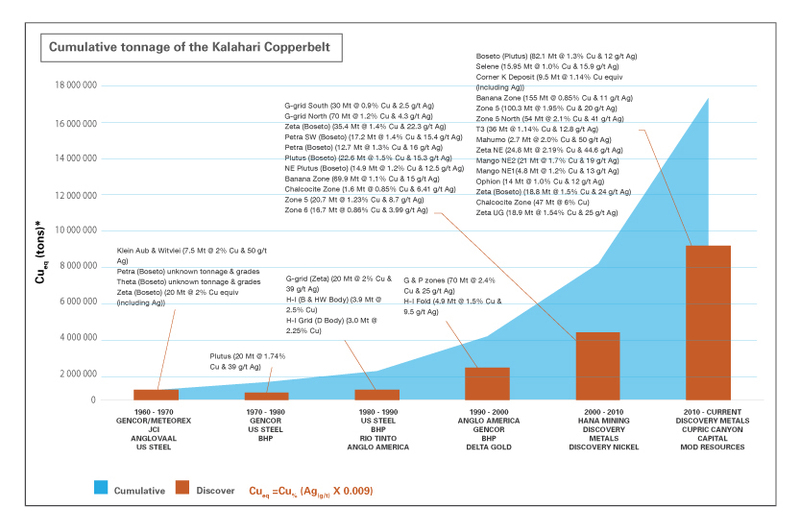 The Kalahari Copper Belt (“KCB”) comprises a 1,000km long linear belt of NE-SW trending volcanio-sedimentary rocks extending from Klein Aub in Namibia to the Shinamba Hills in northern Botswana. The KCB rocks were deposited during the Meso- and Neoproterozoic in intra-cratonic basins on the north-western margin of the Kalahari Craton. These basins were subsequently deformed during the late Neoproterozoic Pan-African Damaran-Lufilian orogeny. Cu-Ag mineralisation is prevalent along the entire KCB with deposits occurring on the contact between chemically reduced shales and siltstones that overlie oxidized red-beds, with many similarities to the epigenetic structurally controlled stratabound deposits in the Central African Copper Belt and Kupferschiefer Cu district. Later deformation has served to remobilise and locally upgrade deposits. Schematic illustration of intracratonic basin architecture responsible for development of stratiform Cu mineralisation and subsequent structurally related upgrading of mineralisation. Despite the 50 years of historical exploration, the Kalahari Copperbelt has only emerged as a world-class mineral province in the last decade. Early exploration campaigns carried out by US Steel, AngloVaal, Anglo American and BHPB focussed primarily on identifying and delineating large, shallow, low-grade, stratabound Cu resources. From the early 2000s, exploration models changed with a greater emphasis on moderate-sized, higher-grade, structurally controlled targets which may be amenable to underground mining. This led to a number of discoveries which were largely attributed to the effective use of high resolution geophysics and better understanding of the geological and structural controls to mineralisation. Recent discoveries highlight the Belt as a significant emerging Cu district. Feasibility studies on Cupric Canyon’s Zone 5 deposit (100.3 Mt @ 1.95 % Cu & 20 g/t Ag) and Mod Resources T3 deposit (36.0 Mt @ 1.14 % Cu & 12.8 g/t Ag) have now been completed with plans in place to commence production in late 2017 and 2019 respectively. Further expansion projects at Zone 5 are scheduled for 2019. Government plans are in place to develop infrastructure to connect the region to the power grid by 2019.